With the regular season just a few days away, my market based NFL rankings are now up and running. 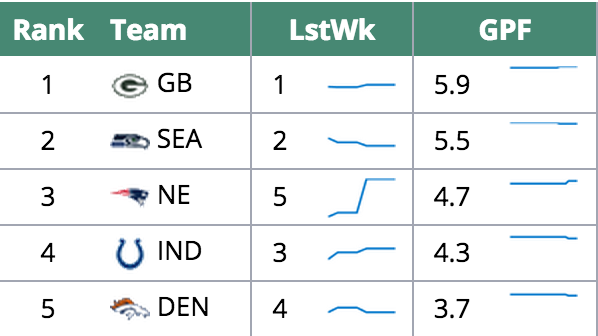 These update daily and are designed to reflect the betting market's ranking of all 32 NFL teams. The rankings themselves use the betting point spreads and over/unders from each game. A simple weighted linear regression is used to reverse engineer a ranking from these pairwise numbers. The key metric here is Generic Points Favored, or GPF, and it is what you would expect the team to be favored by against a league average opponent on a neutral field. By using the point spreads in conjunction with the over/under, GPF can be further decomposed into its offensive and defensive components (oGPF and dGPF). For now, there is just a week's worth of point spreads and totals to work with, which is insufficient to create a proper regression analysis amongst the 32 NFL teams. To get enough connections between the teams, you need at least three weeks of data. To fill in the gaps in the meantime, I have used the full season point spreads as published by Cantor Gaming. This will be my fourth year publishing these rankings for the NFL. When it comes to predicting future wins, they have outperformed a variety of other ranking systems. I am curious to see how they stack up this year against ESPN's revamped Football Power Index. On the right side of the ranking table, there is a column labeled "Projected Seed" with both a percentage and a 16-column bar graph. The percentage represents the team's current chances of making the playoffs (all tiebreakers have been factored in, including coin flips). The bar chart shows the team's chance of making each playoff seed (mouseover for the numbers). The chart goes from seeds 16 to 1, left to right. The top six seeds make the playoffs and are color coded blue. Further to the right, each team's strength of schedule is summarized by taking the average GPF of its future opponents (home field is factored in here too, at 2.5 points). The Colts look particularly lucky fortunate. Despite having just the fourth best GPF in the league, they have the best chance of making the playoffs, owing to the Colts' 32nd-ranked strength of schedule and the NFL's playoff seeding format, which guarantees the top four playoff spots to the division winners. There is a massive gulf between the Colts and the rest of its AFC South brethren (the Texans at #20, the Titans at #30, and the Jaguars in their customary #32 spot). Sticking with the South, but switching conferences, the New Orleans Saints, despite having a lower GPF, are nearly twice as likely than the Arizona Cardinals to make the playoffs (56% vs. 29%). It helps to play in a division in which there was a non-zero chance of a 6-9-1 division winner as late as week 16. The Cardinals play in the far more competitive NFC West, where the Seattle Seahawks trail just the Green Bay Packers as the league's best team. Note, however, the 49ers' precipitous drop. Last year, they opened the season at #3. Following a disappointing regular season and a disastrous offseason, they open the 2015 season at a mediocre #23.